A few days ago I wrote about an interesting type radio signal known as a fast radio burst. 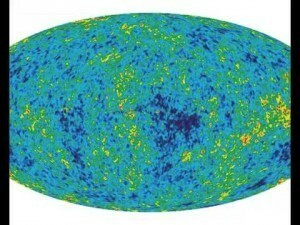 These are short, intense pulses of radio energy that have all the hallmarks of being astronomical in origin. One possible source of FRBs could be a neutron star collapsing to a black hole. But there is still some discussion that such bursts could be terrestrial in origin because of another type of radio burst known as a peryton. The first FRB is known as the Lorimer burst, named after Duncan Lorimer, whose pulsar research group discovered the burst. The Lorimer burst had a couple of distinguishing features that point to it being astronomical. The first is that its spectrum is dispersed. That is, instead of being a simple burst with all different frequencies happening at once, the frequencies were spread out, with higher frequencies first and lower ones later. This whistler effect is characteristic of a pulse that has traveled through the interstellar medium. It occurs because when an electromagnetic pulse interacts with charged ions, different frequencies are slowed by different amounts, with the lower frequencies slowed down more. So you get a dispersion effect. Stray bursts or chirps from terrestrial sources generally don’t have the same dispersion because they don’t travel through plasma and they don’t travel far. Another feature of the Lorimer burst is that it was localized within the detectors. 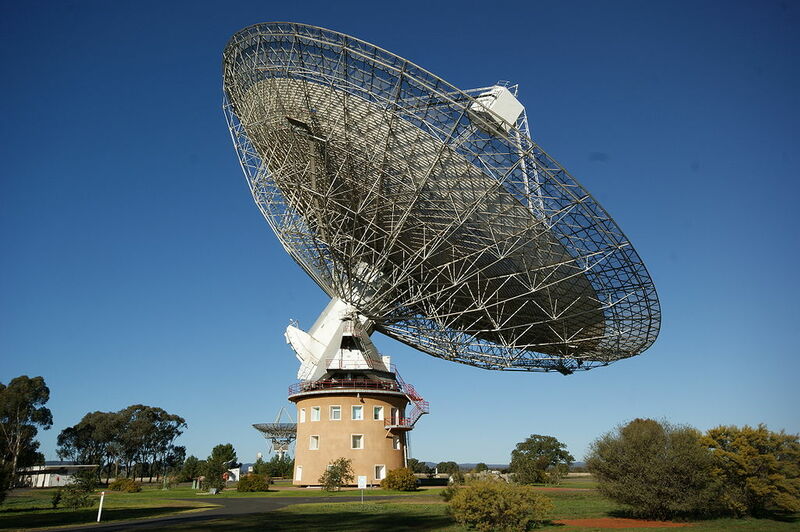 The Lorimer burst was observed at the Parkes radio telescope (seen in the figure), which has a 13 beam receiver. Each beam is the radio equivalent of a pixel in a digital camera. The burst maxed out (saturated) one of the beams, but the others were largely unaffected. This indicates that it was from a single astronomical direction, and not a local electromagnetic burst. Since the Lorimer burst, there have been detections of at least four similar bursts, which is why there is an effort to determine what their astronomical origin might be. But this is where it gets interesting, because in addition to the Lorimer-type bursts (FRBs) there is another type known as perytons. 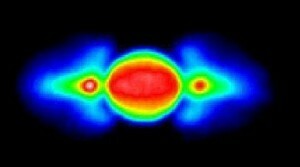 Perytons have a similar intensity, and are also dispersed, but they max out all 13 beam receivers. 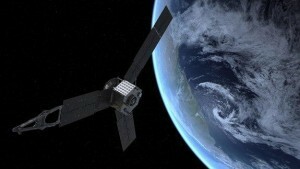 This means they are not from a directed astronomical source, and are therefore terrestrial. These perytons only appear at Parkes, which is also the only place to have observed the FRBs. Since both FRBs and perytons have only been detected at one radio telescope, you might thing that points pretty strongly to both of them being some kind of local interference or glitch unique to Parkes, but that isn’t the case. For one, the Parkes radio telescope is particularly suited to detecting this type of signal, so it isn’t too surprising that only Parkes has detected FRBs. For another, perytons are distinctly different from FRBs. While both are dispersed, they are dispersed in different ways, and the peryton dispersion doesn’t match that of an astronomical source. For now, it seems like Lorimer-type FRBs are astronomical in origin and perytons are terrestrial in origin. Beyond that they are a mystery. You might look at the Centauri-Dreams site to see what I think that really are. Yeah, it seems to be clear at this point.